For over a decade I have swung on a pendulum between “creative” and “playing” and after three years of mostly being in “creative” mode, I seem to be in a deep “playing” cycle of video games. Hence my lack of blog posts as I generally have little to say while in “playing” mode. One of the games I have been playing is Dreamfall Chapters the third game in an adventure game trilogy spanning 16 years. The first game was The Longest Journey from 1999 which was mostly a 2D graphic adventure game with many puzzle solving aspects. By today’s standards it is kind of cheap looking and way too long, but it has one of the most compelling stories of any adventure game at that time. It was followed up in 2006 by Dreamfall. The setting of the three games is two parallel universes named Arcadia and Stark. Stark is a near futuristic “cyberpunk” world of technology, while Arcadia is a renaissance inspired world where magic is real. In between is a dream world that both worlds share. The hero of the first game is April Ryan, a Stark girl who has a natural gift to move between worlds. The second and third games star Zoë Castillo whose gifts to move between worlds were not so natural but artificially induced to create a new vivid dream inducing technology. The third game is about this new technology and how it has become a drug of sorts. The genius writer is Ragnar Tørnquist, a Norwegian fantasy game writer/designer who also was the head writer for the MMORPGs Anarchy Online and The Secret World. Dreamfall was one of my favorite stand alone games of the 00’s filled with great characters and an imaginative story with one annoying flaw: a shocking cliffhanger of an ending we had to wait 9 years to resolve. That resolution finally happened in 2014’s Dreamfall Chapter’s: Chapter 1 which came out a few months ago. There are 5 planned chapters to be released when they get around to releasing them, Chapter 2 comes out on Tuesday, March 10th, which is what I’ll be playing next week. 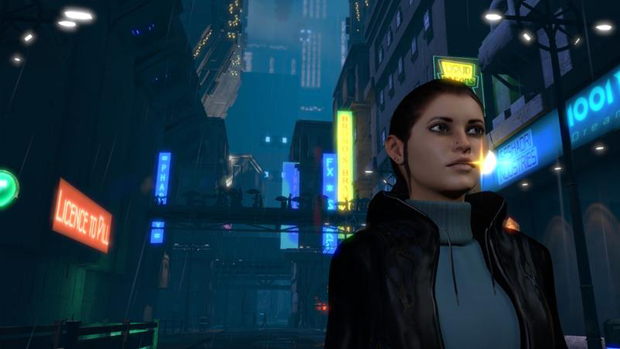 Dreamfall Chapters is being done by an independent studio and relied on crowd funding to get made. Despite this, the game does not look cheap or low budget, the bulk of Chapter 1 takes place in a gloomy futuristic European city which is one of the most immersive places I have seen in a game. Like the first two games, there is plenty of humor and mystery. Also like a good visual novel, choices you make in the game will radically change the game play. Early on Zoë is given a choice of picking up her life where she left off, or starting over on something new. If you pick the former Zoë dresses stylishly and has confident hairstyle, and does lab experiments with a “kidbot”, if you pick the latter Zoë dresses more conservatively, has a simple hairstyle, and runs around testing a salvaged robot named “shitbot”. The former choice seems the better one, but “shitbot” has become very popular among players (“Welding, welding,welding”). If you like games with good storytelling, this is as good as it gets. I’m glad you have found something you really enjoy.